That’s a wrap, folks! Thanks to all who participated in and attended the Poly Drive Talent Show on Friday, March 2. The well-attended event was packed with plenty of great music, variety, art, dance – and dessert! A big round of applause goes to the wonderful student, parent and staff volunteers who helped make the evening possible, the dedicated PTA planning committee and Mrs. Langeliers for presenting a star-studded show! Thanks to Mr. Croff for continued support of the beloved Poly tradition. Thank you to Deva Gallagher and Ms. Walker for coordinating the Art Shows. Sincere thanks also go to Principal Sulser and staff at Lewis & Clark Middle School for being great hosts, and to MSU-B for their student volunteers. Sponsors included Starbuck’s on Grand, Allegra Printing and GE Capital. We appreciate you! The Poly Polar Bear Igloo Construction was a great success! Thank you to all who donated milk jugs – the support for it was amazing! A snowflake with each of the current Poly Drive PTA family names was placed inside the igloo. Students enjoyed using the igloo during their library time. And while the igloo was eventually disassembled and recycle, it will serve as a mathematics and engineering model during the upcoming STEAM Night at Poly Drive. Reflections Art Program is a National PTA program. Twelve student artists participated at Poly this year. Several students advanced to the state level: 1st place-Aubri M. and 2nd place-Ronan G. (K-2 Primary division), and 1st place-Emery P. and 2nd place Maren R. (3-5 intermediate division). State level results were announced in late February, and two Poly artists received Judges Awards: Ronan and Emery. First place winners from state level then advanced to the national level. All of the Poly Reflections artists’ work will be on show at the Toucan Gallery the week of April 16, with an opening reception beforehand. A special thank you to our Poly Drive Reflections judges—Ev Bergeron, Mike Caskey, and Kelly Ewing for evaluating the students’ work. And a huge thank you to PTA Reflections chairperson Deva Gallagher for organizing and guiding the artists in their Reflections endeavors. On Friday, Nov. 11, nearly 150 people gathered to honor and remember the sacrifices made by members of the armed services. Poly Drive PTA again hosted the Veterans Day Breakfast. PTA chairperson Dana Ludden reported the breakfast was a success, with community members and Poly families generously donating to the effort. Special thanks to Starbucks, Evergreen IGA, Perkins, Fiesta Mexicana and the Murillo family, and Poly families that donated items. Special recognition also to Mrs. Robinson’s class for setting up America’s White Table to honor our fallen and missing soldiers. On behalf of the Poly Drive PTA, thank you to all veterans for your service. A little food, fun, and conversation – sounds like a great mix! Poly PTA provided pizza, families brought dessert and other sides to share, and the mixing commenced. Kindergarten and 1st grade teachers attended each mixer, respectively, to share a welcome message and visit with families. Thank you to all who shared food for the event, to teachers and staff for joining us, PTA members for their help with the event, organizer Letha McDowell, and all the families that participated. March Madness: Food, games, fun, duct tape? March Madness Carnival & Dessert Silent Auction is just over a week away, set for Friday, March 23. The evening is one of family fun, filled with food, games, prizes, and the decadent dessert silent auction. This year, Principal Croff has accepted the Duct Tape Challenge: he will be duct taped to the wall during March Madness, if we raise $500 before the carnival begins. Wristband purchase allows for unlimited game playing and winning through the evening. Each classroom features a unique game, and students win tickets to be redeemed in the prize room. Parents can also browse the delectable dessert offerings available at the Decadent Dessert Silent Auction. You can be involved in many ways: volunteer for a shift or two at a classroom game, help out with serving food (pizza, cookies and chips), selling wristbands and food punch cards, or lend a hand with setup and clean up. Volunteers are also needed to assist with the Duct Tape Challenge to duct tape Principal Croff to the wall during March Madness. 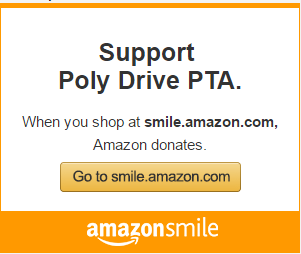 To volunteer, use myschoolanywhere.com or contact Renee at polydrivepta@gmail.com. Wristbands are available for purchase via flyer through March 20, at the front office through March 23, and available at the door that evening. Pre-purchased wristbands are $12 each, and will be $15 at the door. Cash or credit card payment will be accepted at the door. Pizza, chips, cookies and water are also available during March Madness. Cash or credit card payment may be used. The Poly Drive Talent Show, a fun evening for the whole family, will be held at Lewis & Clark Middle School on March 2. Showtime begins at 6 p.m. In addition to the wide variety of talents featured in the show, student artwork will also be on display. Artwork will include submissions to the Juried Art Show and the Reflections Art Program. Other talents will be featured in the Talent Showcase display. This is truly an evening for all Poly students to shine! Please bring a dessert or snack to share during the dessert reception immediately following the show. A DVD of the evening’s showcase will be available for purchase in March. It’s time again for the Butter Braid Fundraiser. Just in time for the holidays, these make great gifts! What are Butter Braids? They are frozen pastry dough, made with 10% real butter, giving them a rich, homemade taste. They come in various filling flavors: Apple, Blueberry & Cream Cheese, Cherry, Cinnamon, Raspberry, Strawberry & Cream Cheese and Four Cheese Herb & Marinara. This year Caramel Rolls are also available. They are delicious and beautiful and easy to prepare…thaw, bake and eat! Butter Braids are sold for $14 each. This year the profits will support Poly PTA sponsored activities and clubs such as our White Ribbon Week, Spanish Club, Talent Show and End of Year Celebration. We are also continuing our efforts to expand STEAM (Science, Technology, Engineering, Art and Math) opportunities at Poly and ensure every student has an iPad or Chromebook for their use in class. We are excited to offer prizes to the top sellers, so please plan to participate! We encourage you to be safe when selling. Sell with a parent or adult accompanying you. Sell at workplaces, church groups or other groups. Important: Payment MUST be collected at the time of the sale. Poly Drive PTA pays for the Butter Braids up front so we need to have the payment from your customers up front also. If you would like to cover the cost of your orders and then collect at the time of delivery, that is up to you. Checks should be made out to Poly Drive PTA. In order for this fundraiser to run smoothly we are asking for your help in one additional area. If the student wants to figure their sales and money all on their own, please have the order and the money collected double checked by an adult. We have received many orders in the past that had to be returned to the student for correction, slowing down the process. The order forms need to be turned in by Wednesday, November 29. Delivery to the school will be Wednesday, December 13. Mark your calendar to pick up your orders on Wednesday December 13 between 1:00 and 3:00. We have very limited freezer storage for any orders that are not picked up. Thank you in advance for all your hard work and support. Please contact chairperson Tori Koch if you have any questions! Can’t make it? A portion of your purchases online and instore from Nov. 19-24 will go toward Poly Drive’s Bookfair proceeds. Go to https://www.barnesandnoble.com to order, use ID 12241071 at checkout and in store. For online checkout, you will select “bookfair order” at the bottom of the payment page and be prompted to enter the ID there.